Gennison made of Elements Reusable Grocery Bag: Get rid of disposable plastic bags and help save the planet with our reusable grocery bag! Customize with your own text or images for a reusable bag great for a trip to the grocery store or farmers market. Made with a lightweight polyester fabric, this bag folds up easily to fit in your purse or pocket. Check out other products with this design or view all hats, bags & accessories. 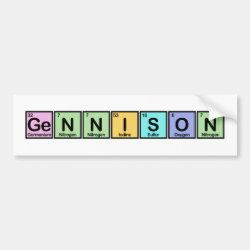 This reusable bag with our Gennison made of Elements design is made-to-order by Zazzle.com. Zazzle offers 100% money back guarantee on our high quality Cute Union products. In case you are not happy with your purchase, you can always return your reusable bag for an exchange or refund within 30 days of receipt. See customer service for more information.